Posted: June 21, 2015 in Fotos, Who,What,Where & When...? Contributor Stephen Dalton nutted out the driver, perhaps because the photo’s ‘donor’ John Medley has written a book ‘John Snow Classic Motor Racer’. I have just commenced it. Its a fascinating insight into Snow’s life and also the difficult times both immediately pre and post World War 2. Perhaps i can prevail upon John to write a truncated version of Snow’s fascinating life? Back to the photo though; Snow was in Europe on both a buying trip for the family department store in Sydney and to race and test some cars with a view to bringing them back to Australia for his own use/sale. He identified the Hans Ruesch owned and driven Alfa Romeo 8C-35 as such a car, he tested it at Brooklands as shown, this photo until very recently thought to be Ruesch, proved otherwise by Medley. 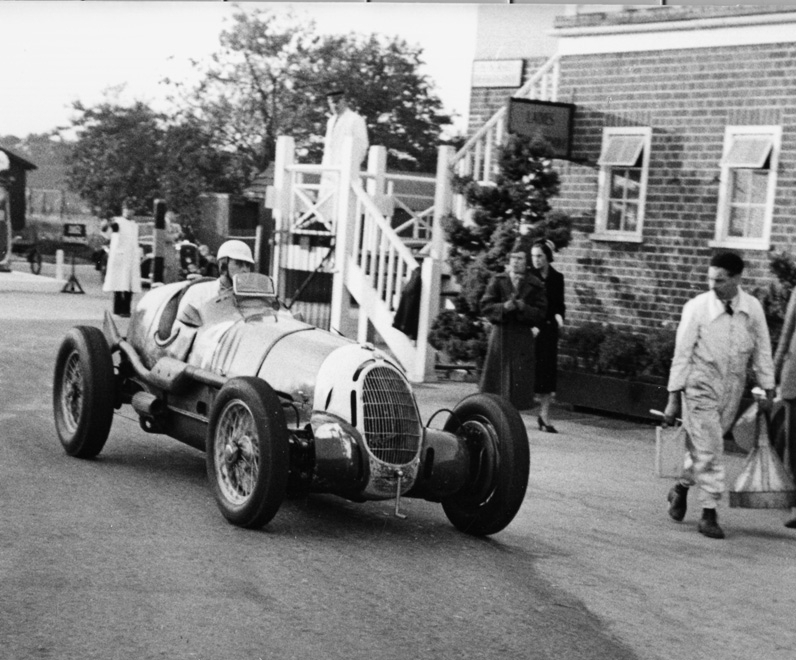 Medley’s book states that after the Brooklands test, here Snow is passing the Clubhouse, he then hired the car for meetings at Crystal Palace, Donington, Brooklands and Cork. Unfortunately for Snow, the car, with Buddy Featherstonhaugh at the wheel crashed badly during practice at Donington and was then sent back to the factory for repair. Looks very UK, I see that the ladies look as if they have been visiting the conveniences? If I’m allowed to have a second guess then, I’ll give John Snow a crack this time.